Neoconservatives planned regime change throughout the Middle East and North Africa 20 years ago. Robert Parry correctly points out that the Neocons havesuccessfully “weathered the storm” of disdain after their Iraq war fiasco.But the truth is that Obama has long done his best to try to implement those Neocon plans. Similarly, ever since the Soviet Union collapsed in 1991, the U.S. has pursued a strategy of encircling Russia, just as it has with other perceived enemies like China and Iran. 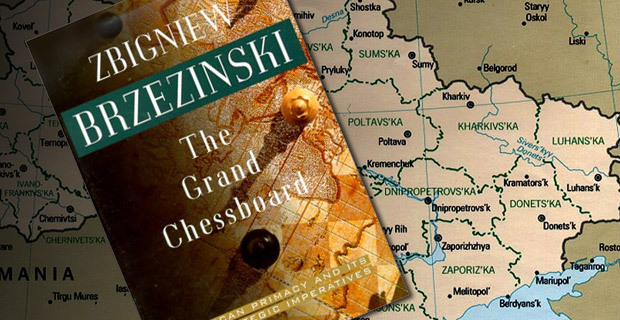 In 1997, Obama’s former foreign affairs adviser, and president Jimmy Carter’s national security adviser – Zbigniew Brzezinski – wrote a book called The Grand Chessboard arguing arguing that the U.S. had to take control of Ukraine (as well as Azerbaijan, South Korea, Turkey and Iran) because they were “critically important geopolitical pivots”. And now Obama is pushing us into a confrontation with Russia over Ukraine and the Crimea. Late last year when Ukraine’s now-ousted president Viktor Yanukovych surprisingly canceled plans for Ukrainian integration into the European Union in favor of stronger ties with Russia, the US may have viewed Ukraine as slipping even further out of its reach. At that point, with the pieces already in place, the US moved to support the ousting of Yanukovych, as evidenced by the leaked phone conversation between US Assistant Secretary of State Victoria Nuland [arch-NeoconRobert Kagan‘s wife] and US Ambassador to Ukraine Geoffrey Pyatt. When peaceful protests were not effective in unseating Yanukovych, the violence of the ultra-nationalist Svoboda party and Right Sector was embraced, if not supported by the west. In other words, Obama is following the same old playbook that the Neocons have been pushing for more than a decade.